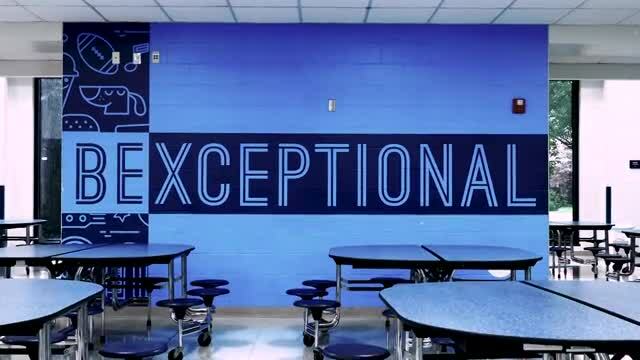 The Bexley City School District's Blueprint guides all work in order to attain the District's Mission and Vision. This strategic plan was unanimously approved by the Board of Education at their August 20, 2018 meeting. Through the process of developing this plan, the district also updated its vision and mission statement, along with new core values that were formed by our Bexley Community. Our mission is to provide educational experiences that engage, equip and empower each student. The "Bexley Blueprint" will guide us to engage, equip, and empower each Bexley student both today and tomorrow. We strive to be a learning and growing school district. 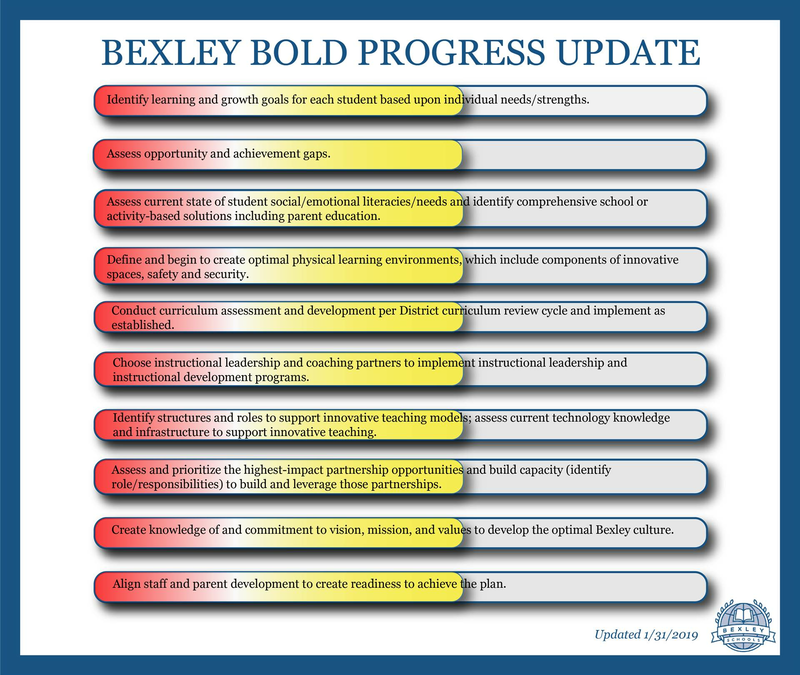 It is our goal to be Bexley Bold! Great ideas and concepts, but what does this actually look like in practice? How do we invest/coach/develop teachers without pulling then out of the classroom? Job-embedded instructional coaching has been found to be one of the most successful ways to impact classroom instruction. Therefore, the Board of Education will be presented with job descriptions for instructional coaches at the December 2018 Board of Education meeting. We would like to hire these coaches for the 2019-2020 school year. With job-embedded coaching, there is less need to pull teachers from the classroom for professional learning. Coaches do not completely eliminate the need to teachers to sometimes be out of the classroom, but it can be reduced. As part of the aligned/focused plan there has been talk about changing elementary schools around. Is that a consideration? Has there been any consideration given to dividing the elementary schools into different grade levels (e.g., K-1, 2-3, 4-5)? As part of the strategic planning process, no discussions of building configuration was discussed. However, one component of the strategic plan is the establishment of a Facilities Advisory Council. This group has been convened and is assisting with early discussions of how to address facility needs that we have primarily space (increasing enrollment), 21st Century Teaching, and energy efficiency. This group will not make any decisions but will help to consider potential solutions that we will then take to the community for input. As they work all components of facilities will be discussed including configuration, but no decisions will be made without community input. How do innovative teaching methods mesh with required standardized testing? All testing, whether standardized or classroom-based, is designed to assess student learning. Teaching strategies are the approaches to instruction that teachers use to help students to learn. More involved and engaged students learn more. Innovative teaching strategies include approaches such as problem-based learning, inquiry, and focus on critical and deep thinking. The purpose of using such strategies is to get students engaged in content to get to deep learning and understanding not just surface knowledge that can be remembered for a test but easily forgotten. We want students to learn not just memorize. A child who has a well-developed understanding of a topic or content is ready for any type of test. How do we avoid “teaching to the test”? Are you hamstrung by state standards/requirements in making many of these changes & creating more of these new opportunities? No. Standards outline the types of knowledge and skills that students should learn. How we teach and the experiences that we provide to get to that learning has always been and continues to be at the discretion of the district and teacher. What has been the response from the teachers in terms of assessment & implementing the plan? Lots of extra work? Overall we have had very positive feedback from our teachers. The strategic plan is not extra work; it is the work. We are eliminating some of our old practices that are not effective to focus on our new direction. There is change for teachers, but our plan is informed by our staff as well as our community and research. We are focused on doing the work that our students need from us now. 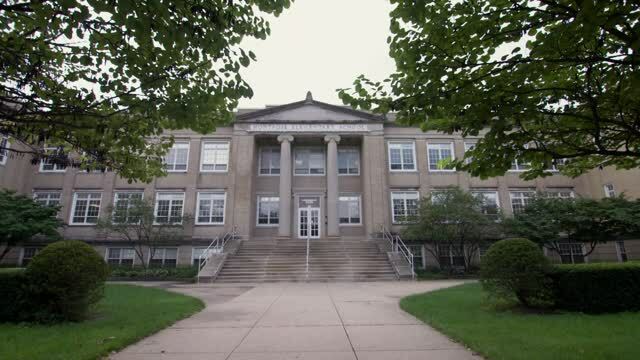 Why was the IB program eliminated instead of expanded to all three elementary schools? The strategic plan was informed by our students, staff, parents, and community. The primary area of need was to be an aligned school district. The former practice of each school being guided by different theories and ideas was leading to misalignment that impacted student learning. We are keeping all former practices that are effective and expanding those across the district and moving away from practices that were not effective or that do not align with the plan and community values. Finally, IB does not promote the concept of specific services for gifted students, a value that was expressed during the strategic planning process. Also, we were required to send teachers out to specific training that does not necessarily benefit each of our students. It does not make sense for us to align to a program that does not fully align with our values. That said, we will keep and expand the components we value: inquiry, using a learner profile, and global thinking. At what point were teachers, administrators, and parents specifically asked to weigh in on the issue of whether the IB program should be eliminated or expanded to all schools? Students, staff, parents, and community members were asked to identify district strengths and areas for growth. The strategic plan was developed with that information. One of the most common areas for growth was the need for aligned curriculum and teaching and learning philosophies. No one was specifically asked about any particular program or offering. What is the difference between an opportunity gap and an achievement gap? An opportunity gap takes place when there are barriers to participation. For example, if the true cost of participating in an extra-curricular or co-curricular program is too high for some students/families, then an opportunity gap exists unless we are aware and have a plan in place to address it. An achievement gap takes place when student from a particular group academically achieve less than their counterparts. How do special needs students get addressed by the strategic plan? The strategic plan is written and guided by our mission to engage, equip, and empower EACH student. Within each theme, objective, and goal staff implement strategies and action steps in their buildings and departments. The special education department is part of the plan and will implement action steps that specifically relate to special education. For example, one of our annual goals is to identify learning and growth goals for each student based upon individual needs/strengths. One of the strategies to achieve that goal is to “explicitly communicate learning goals to students.” In October our special education Parent Mentor attended a conference on resources to use with children in developing IEP's or setting goals and a pathway to success. This information was then provided to intervention specialists as tools to support communicating and supporting learning goals. How will you know if the strategic plan is working, and what happens if it isn’t? What KPIs (Key Performance Indicators) are you using to judge how you and your new strategic plan are working? We will gather both quantitative and qualitative data to determine if the plan is working. Our plan is heaving focused on implementing consistent curriculum, innovative teaching strategies, and instructional coaching and leadership. The purpose of this work is to improve student learning. Therefore, standardized test results should increase for our student population overall We also expect to observe a reduction in achievement gaps for specific groups of students. We will decrease the number of students who graduate without a clear pathway to post-high school life. There will also be specific plans or implementations that will be have achieved. For example, a facilities plan should be developed and implementation begun within three years. A Student Success Profile will be developed. We will be able to identify how partnerships are providing students with experiences that do not currently exist. Finally, qualitative data will be collected regarding culture among staff and perceived student experience. If the plan is not yielding the results we expect, then we will make adjustments. Our plan is designed to be a living plan that will be updated annually with new goals, strategies, and action steps. Does the strategic plan specifically address the multiple, redundant technology variants used across the District and work to consolidate them and when? (e.g., Powerschool, Canvas, Classroom Dojo, etc. Because Bexley has not had a strategic plan for many years, there is a great deal of assessing that must take place initially in order to address some of the specific needs of the District. In the area of technology, the first year work is to analyze the technology integration surveys that were completed by students, staff, and parents in late fall 2017, conduct a tech infrastructure audit, and develop a technology advisory council. With that initial work completed, a comprehensive technology plan will be completed. The assessing stage will be used to determine the priorities of the technology plan. How can we leverage community relationships to broaden our students cultural horizons beyond the limited diversity within Bexley city limits? I am a Columbus Public School graduate and we were required to do an internship one day out of the week. Itw as an experience that helped me grow as a person and provided me an opportunity to figure out what I might want to do as an adult. Will these opportunities be for a specific grade,..certain students,..or all be mandated to participate? Our plan directly addresses the need to develop community relationships in order to enhance students’ experiences and future opportunities. One step that we have taken already to develop a job description for a Coordinator of Experiential Learning and Community Partnerships. If we are able to hire this position, we will be able to expand opportunities for students outside the traditional classroom. While internships would likely be offered to our high school students, we want to expand experiential learning to all students K-12. How is the inclusiveness value being reflected in the plan and goals with regard to our underachieving populations? As stated above, we recognize that we have underachieving populations. Our commitment to investing in the development of those who lead and implement instruction, consistent curriculum across the district, aligned instructional goals, and identifying opportunity gaps are all steps that we are taking to assure inclusiveness. How will you measure success in the following? 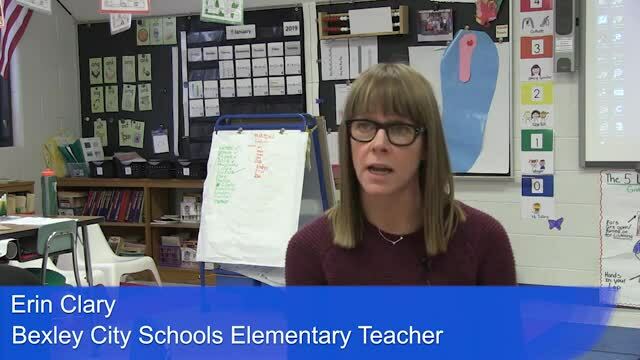 Leisan Smith, Director and Staff and Community Engagement is leading the work to identify a tool that will allow us to assess those mindsets in order to design and implement programming and services to promote and develop each of our students in those areas. We expect to have a tool identified by January and then pilot in the spring to establish baseline data and knowledge of how to be use the tool. As part of your efforts to promote cultural awareness will that include the following? Incorporating cultural awareness activities for staff/teachers to better understand their students. Involve increasing number of diverse teachers in the high school. 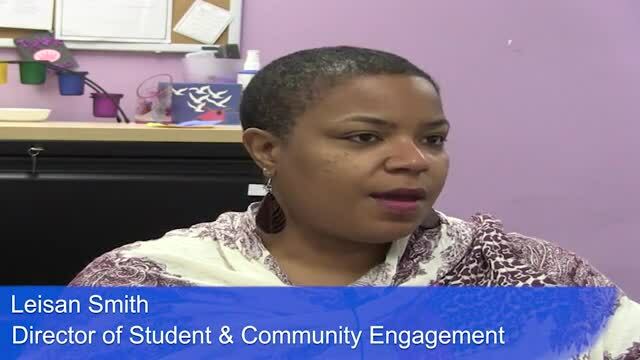 Incorporating diverse lesson plans that promote cultural awareness and acceptance. We have a District Climate Committee that meets monthly to develop professional development for staff around cultural awareness for staff. The District committee is made up of teachers from each school, and they take the lessons back to their own staffs. This committee is also instrumental in developing programming for our students. 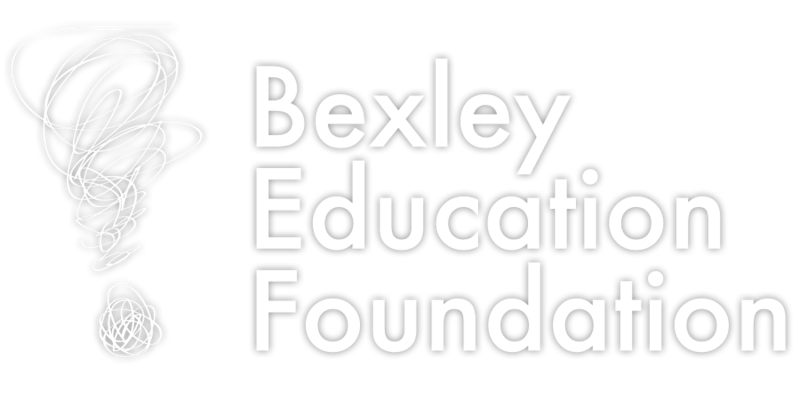 We also partner with the Bexley Minority Parent Alliance, the Bexley Public Library, and the City of Bexley to bring learning opportunities that promote awareness, sensitivity, respect to ur community. Having a central office administrator overseeing human resources for the first time has created the capacity for us to better recruit diverse staff for our schools. Already steps have been taken to partner with local universities to recruit a more diverse teaching staff.